Multi-Tenant: Newfies-Dialer is multi-Tenant, so many customers can operate their voice broadcasting campaigns on the same platform at the same time. Billing: A per minute rate can be set against each customer, as customers run their outbound IVRs, their balance is decremented. SMS messages are charged per SMS. When the balance reaches 0, no more calls can be made. 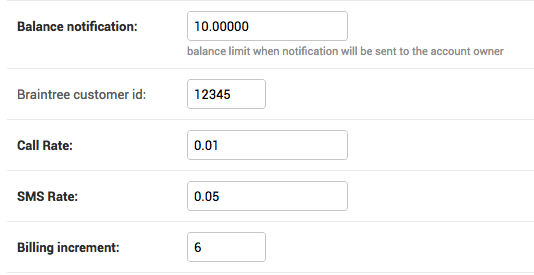 Email Notifications: A low balance notification can be set against the customer, so that when their balance reaches the preset threshold, an email notification is sent out informing the customer that they do not have much credit left to make calls. Credit Card integration: Newfies-Dialer is credit card and Paypal ready so that customers can top-up their accounts without administrator intervention. Revenue Protection: When the customer’s balance reaches 0, then calls will stop preventing the customer from going into negative balance. For any company wishing to sell outbound IVR software and services, Newfies-Dialer may have the answer, either by setting up a single system to service your customers, or by acting as a reseller to sell dedicated systems. Contact us for more details.